A variety of different methods for excising the distal ureter and bladder cuff during conventional and hand-assisted laparoscopic radical nephroureterectomy have been described. The findings of contemporary single-institution series describing the most clinically significant experience with laparoscopic radical nephroureterectomy are listed in Table 2, stratified by type of distal ureter and bladder cuff approach. These methods can generally be classified into five typical approaches as listed in Table 3, although various other modifications have been described in the literature. In 1952, McDonald et al. described the first endoscopic method of distal ureter and bladder cuff excision, which was performed on a patient presenting with extensive tumor in a residual ureter after having already undergone nephrectomy (9). The ureter was disconnected from the bladder by transurethral resection also known as the "pluck" procedure) of the perimeatal bladder and intramural ureter. The open distal end of the ureter was sealed with fulguration, and the remaining detached ureter was then "plucked" through the open incision by traction. This technique and its various modifications have been described in several contemporary series of laparoscopic radical nephroureterectomy (13,14,37,38). Local recurrences after transurethral resection of the ureteral orifice have been reported in several publications (see the section Local Recurrences: Port Site and Ureteral Stump). It is unlikely that fulguration provides a meaningful seal against urinary leakage, and the risk of leaving a discontinuous, isolated segment of ureter in the extraperitoneal space exists. This approach may be useful for patients who have no ureteral or bladder tumors and have undergone pelvic surgery such that an additional lower abdominal incision would add substantial morbidity. In 1953, McDonald described another endoscopic technique of distal ureterectomy, in which cystoscopic incision of the perimeatal bladder wall is performed and a ureteral catheter is placed. During nephrectomy, the ureter is divided, and the residual segment is tied tightly to the ureteral catheter with a suture. The ligated ureter is stripped, or intussus-cepted, through the urethra by traction on the ureteral catheter (39). In 1983, Clayman et al. Abbreviations: LOS, length of hospital stay; TURUO, transurethral resection of ureteral orifice; TUDL, transurethral detachment and ligation. aNo significant difference in disease-specific survival between open and laparoscopic groups (P = 0.6775); no exact numbers provided. bSurvival calculated from data provided. cSurgical data not stratified by approach to distal ureter. Source: Modified from Ref. 36. Abbreviations: UTTCC, upper tract transitional cell carcinoma; CIS, carcinoma in situ. described 18 patients who underwent this procedure during open nephroureterectomy; 14 of them were followed up for five years with no local recurrences (40). The use of this method is still occasionally reported in contemporary series of laparoscopic radical nephroureterectomy (27). Laparoscopic stapling of the distal ureter and associated bladder cuff is a newer technique that is performed in conjunction with cystoscopic unroofing and scarification of the ureteral orifice (15,16). Stone encrustation along the staple line has not been a problem on long-term follow-up in the limited number of patients who have undergone the procedure, although the staples may be visible on cystoscopy (15,41). The small segment of tissue within the incorporated staple line on the specimen side is unavailable for pathologic evaluation of margins, whereas at the other end, the same tissue remains viable and a potential source of extravesical recurrence (42). This method has the unique advantage of keeping the urinary tract closed, which may be advantageous for patients with a history of radiation therapy, or other risk factors for prolonged leakage, and for those in whom urine or irrigant extravasation must be avoided (15). A novel method of en bloc transurethral detachment and ligation was described in 1999 (43). A ureteral catheter is initially threaded through an Endoloop® tiea and into the ureter. The bladder cuff is circumferentially incised, and the intramural ureter is dissected using a Collins knife aided by two suprapubic, transvesically placed 5 mm laparoscopic ports. The endoloop is then used to ligate the ureter against the catheter, preventing spillage from the upper urinary tract into the extravesical space during the subsequent laparoscopic approach. In the initial set of patients, no differences in the rates of bladder, local, or distant recurrence were noted between those undergoing laparoscopic and open nephroureterectomy after 11 months (18). An analysis of 59 cases with two years of follow-up revealed the transurethral detachment and ligation technique to be oncologically feasible, and was associated with significantly fewer positive margins and local recurrences than laparoscopic stapling (35). A variation of the transurethral detachment and ligation technique has also been described in a smaller number of patients undergoing hand-assisted laparoscopic radical nephroureterec-tomy (44). This method, in general, comes closest to mimicking the classic open approach of distal ureter and bladder cuff resection, but requires a variety of instruments, can be technically challenging, requires patient repositioning, and is contraindi-cated in patients with active bladder disease. Open dissection remains one of the most common methods of excising the distal ureter and bladder cuff. Patient repositioning is usually not required, and this one incision is used for simultaneous intact extraction of the en bloc specimen. An open approach may aEthicon, Somerville, NJ. be performed transvesically or extravesically, usually via a low Gibson, modified Pfannenstiel, or lower midline incision. Some surgeons insert a ureteral catheter at the beginning of the procedure to facilitate dissection, but it is usually not necessary. Care must be taken to avoid injury to the contralateral ureteral orifice. Note that, even with open nephroureterectomy, a residual ureteral stump has been reported in up to half of patients (45), with recurrences in the stump occurring in 30% to 64% of these cases (3,46). Thus, an open approach does not guarantee complete ureteral resection or negative margins. In particular, an extravesical approach performed by palpation only risks a residual stump (Fig. 1). Contemporary pathologic practice does not typically identify or confirm the presence of bladder mucosa at the distal margin of resection; it is thus the surgeon's responsibility to visually confirm the presence of this tissue during open, laparoscopic, or endoscopic surgery (Fig. 2). At our institution, most patients undergo cystoscopy and transurethral resection of tumor within 24 to 48 hours prior to surgery. Those found to have bladder tumors are given intravesical Mitomycin-c (40 mg) in the recovery room immediately following transurethral resection of tumor. Our routine practice includes intact, en bloc specimen extraction with an open bladder technique, usually via a lateral extraperitoneal approach typically used for extravesical dissection. However, the superior vesical artery and the lateral pedicle of the bladder are first fully divided, allowing the entire intramural ureter to be readily dissected down to the ureteral hiatus. The bladder is then opened using Metzenbaum scissors or electrocautery, the bladder cuff is excised under direct vision, and formal bladder repair is performed (Fig. 2). 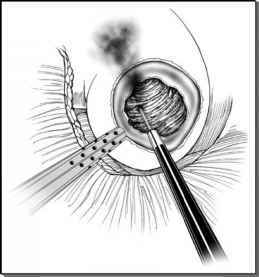 Thus, visual resection of the entire cuff is performed. Such dissection may be difficult in obese patients, in those who have undergone pelvic surgery, and in the setting of prior pelvic radiation. Open transvesical excision by bisecting the bladder is the primary technique used when tumors are located in the intramural ureter, or in cases of suspected invasion of the distal/intramural ureter. The influence of selection factors notwithstanding, caution should be exercised when performing a transurethral resection or stapling procedure for excision of the distal ureter and bladder cuff. However, these alternatives provide the surgeon with operative flexibility and are viable options in individual cases of anatomic difficulty. The number and variety of approaches to excision of the distal ureter and bladder cuff and the absence of a standardized approach attest to the difficulty of integrating surgical anatomy with transitional cell carcinoma biology. Additional indications and contraindications for these techniques based on patient and tumor factors are presented in Table 3.